In a great article at https://www.michaelwest.com.au/ Michael West goes behind the veil of the retirement village industry. He points out that Grandma and Grandpa have become, unbeknown to them, corporate financiers through their lease/licence of a unit in a retirement village. 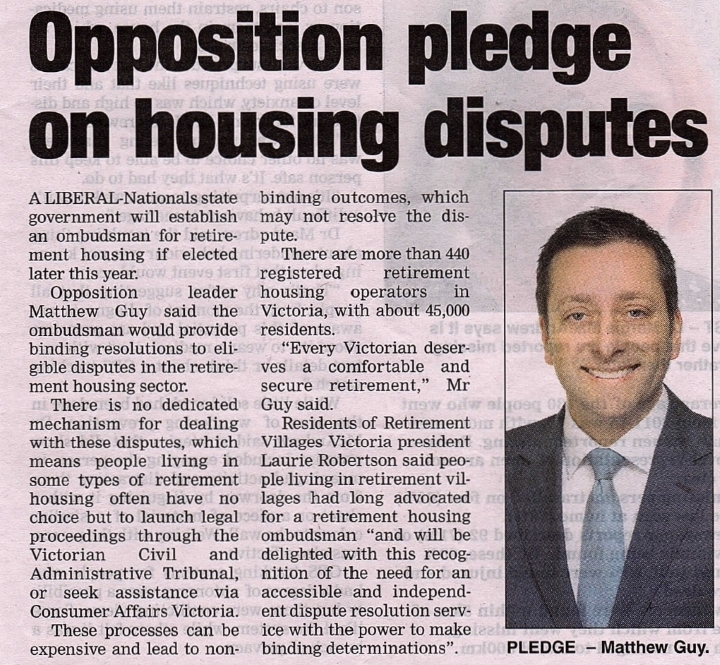 "It would be interesting to know just how many retirees know, when they finally alight upon a leafy retirement village to while away their twilight years, that they are using their nest eggs to make a large, unsecured, interest-free loan to a property developer." This article is a must read for all legislators, current and prospective residents of a retirement village. 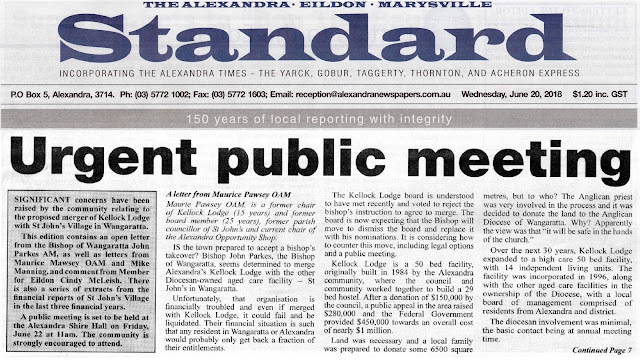 Hands Off Kellock Lodge is the headline from a feature supplement in the June 27 edition of The Local Paper. Locals from the Alexandra district are scathing of Bishop John Parkes and the Wangaratta Diocese in letters to the editor. "This whole fiasco reflects raw opportunism, unwarranted haste and pressure, and complete lack of understanding of the Alexandra community." "There is a breathtaking arrogance about the Bishop's behaviour." "Bishop Parkes is doing untold damage to any reputation that the Anglican Church might have had remaining in Murrindindi shire." 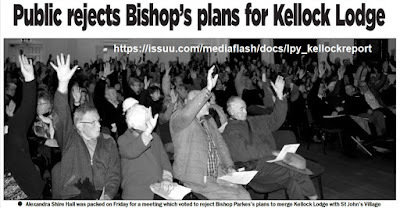 "The Melbourne Anglican Archbishop appears impotent to stop Bishop Parkes' grab for Kellock Lodge." Alexandra locals have expressed their displeasure at Bishop John Parkes and the Diocese of Wangaratta. Bishop Parkes has declared that Kellock Lodge in Alexandra is to be merged with what appears to be a financially troubled St. Johns Village in Wangaratta. 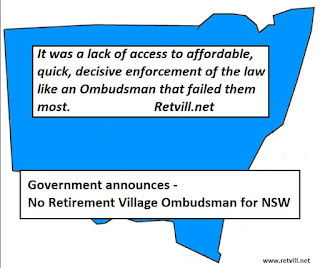 Media reports of announced retirement village reforms for New south Wales appear to fall well short of what is needed to fully protect retirees. A significant omission was the establishment of an industry Ombudsman. "Retirement villages will have to abide to a mandatory code of conduct — and will be policed by retirement village ambassador — in a range of sweeping reforms set to be introduced to the sector in New South Wales. Improving up-front disclosure provided to prospective residents, making it simpler to understand the critical terms and conditions. A legally-binding exit fees and charges statement is provided early in the process. A requirement for operators to provide residents with an opportunity for a regular contract check-up during their occupancy. A requirement for an operator to buy back the unit after a maximum timeframe from a resident leaving the village that is a registered interest holder. Simplifying the funding arrangements for maintenance. Increasing Fair Trading's oversight of retirement villages through targeted compliance activities that focus on retirement villages. The introduction of a code of conduct." 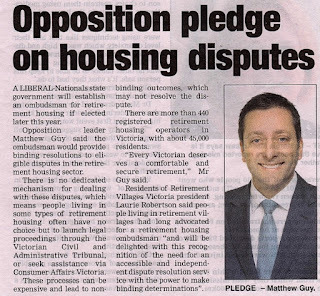 In an article in the latest Seniors News magazine Victorian opposition leader Matthew Guy has outlined a pledge for a Retirement Living Industry Ombudsman if elected in the Victorian State elections later in 2018. The residents of Alexandra in Victoria believe the phrase 'stand and deliver' is alive and well in 2018 but the surprise is that the order is coming from a Bishop of the Anglican Church. Bishop John Parkes from the Diocese of Wangaratta is leading a move to forcibly merge the Kellock Lodge aged care facility in Alexandra with the St. Johns aged care facility in Wangaratta. Both the facilities are in the Diocese of Wangaratta. At a standing room only public protest meeting held in the Alexandra town hall, over 300 residents of the community expressed outrage at what was taking place. Some 30 years ago a local family donated land to the Anglican Church for the purpose of caring for the elderly of the district. The church was not asked to provide any funds for the development of the facility and it never did. The church has never been asked for any money over the following 30 years and it has never given. At the public meeting speakers stated that the facility in Wangaratta is in a financially precarious position and the motive for the move is to incorporate a stated nine million dollars held in cash assets by the Alexandra facility. The residents of Alexandra are fearful the Diocese of Wangaratta may have the legal rite to take such action but the morality of a christian organisation making such a move came under heavy criticism at the public meeting. A. 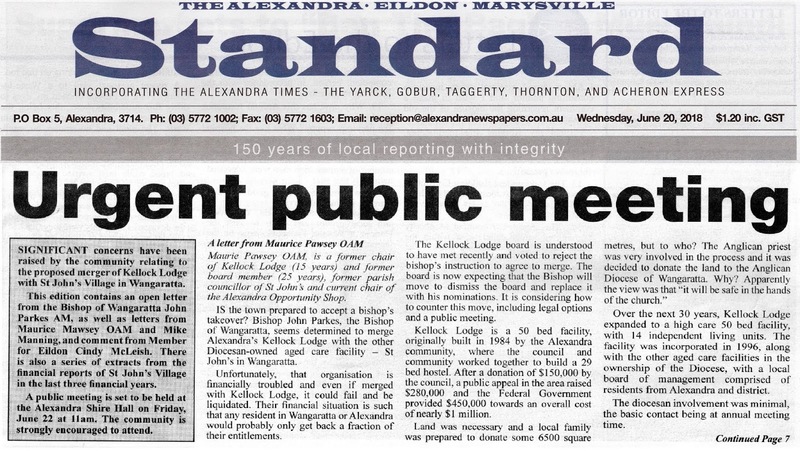 That this public meeting of the Alexandra community rejects any moves to shift control and management of Kellock Lodge and its assets out of Alexandra into a new new company based in Wangaratta. B. That this public meeting requests the Kellock Board to investigate whether any avenues exist for the transfer of the land to an appropriate community based entity. From the mood of the meeting it seems clear the name Bishop John Parkes will never be forgotten in Alexandra but for all the wrong reasons. All Churches are struggling to maintain public relevance in the modern world, the Anglican church in Alexandra may suffer a community backlash from which it does not recover. This was not about nickle and dimes, this was about big dollars. Access to capital gains is essential to retirement village residents by providing some protection from a slide in their capital value over their occupancy. A flat or falling property market will pose financial risks for many residents over their period of occupancy. Retirement village contracts contain various models when it comes to who gets the capital gain. Some contracts grant the resident 100% of the gain, some have a sharing clause such as 50/50 whilst in some contracts the resident gets no share of any capital gain. Prospective residents need to be aware that contracts that grant capital gains to the residents generally have a clause where the resident is also responsible for capital losses to the same ration of gains. The following table charts the potential differing impacts on a resident from varying capital gain rates achieved over their period of occupancy. The industry average occupancy period in a retirement village is 7 years. A big decision for Australian retirees. Federal governments are increasingly encouraging retirees to stay longer in their place of residence which may not necessarily be the original family home. Contradictory encouragement comes with incentives for older retirees to sell the family home and downsize into a unit, flat or into some form of retirement community living. In the example below the table examines the potential financial impact on a retiree between retaining the family home or moving into a retirement village. It must be noted that such a move can be a complex decision and requires sound, independent, professional advice whenever possible, it can be more than just a dollars and cents decision. There can be a dramatic impact over time on the $ value of the refundable amount (in-going cost minus the deferred management fee) repayable to the resident on departure. - Costs associated with a retirement village not generally associated with a residential lease - maintenance, refurbishment, administration. This impact has the capacity to create a 'poverty trap' for some residents should they choose to leave the village to re-enter the property market or need to meet aged care costs. Industry data shows 41% of retirement village residents receive no share from the village operator of the appreciation in property value which may have offered some protection against the above situation. 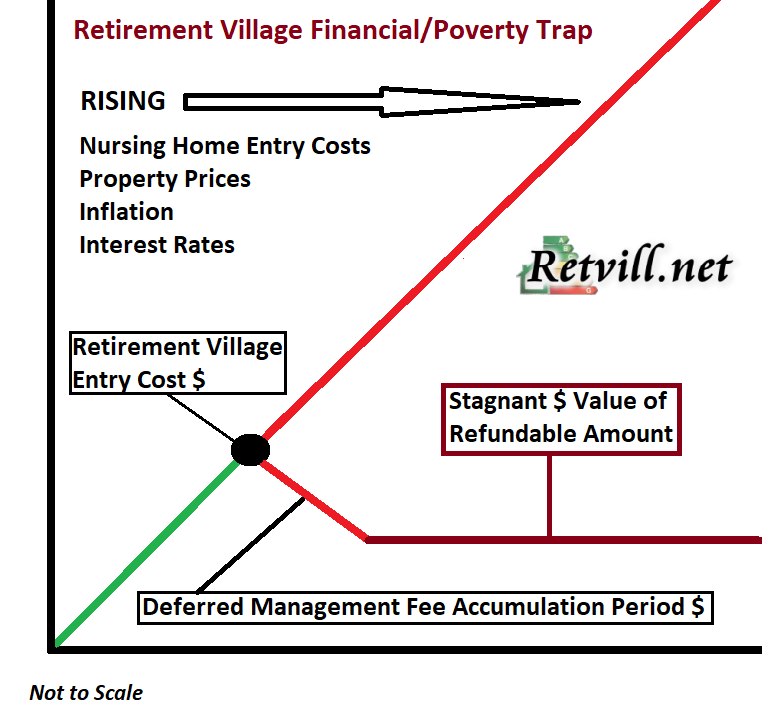 The higher the percentage of lifetime savings used to enter the retirement village, the higher the likely hood of the resident being trapped into their current situation and unable to change direction without family assistance. 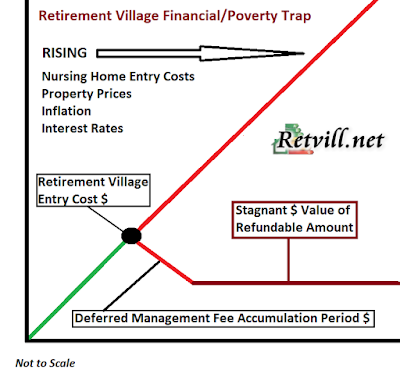 There is no legislative protection for retirees from this so named retirement village financial/poverty trap.